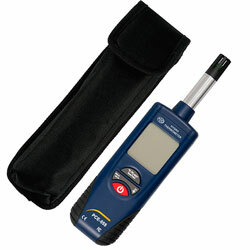 This hydrometer has been developed to take quicker measurements of humidity and temperature. 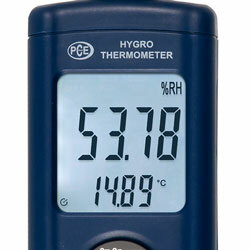 The PCE-555 hydrometer also offers a calculation of dew point and information about wet bulb globe temperature. This allows for the elimination of fungus in food storage, as well as in food transportation. It is also very useful in the construction industry in order to determine condensation in walls. Thanks to its solid design, this hydrometer is ideal for taking measurements in situ, so long as the humidity sensor is not touched, not manipulated or not placed directly into liquid as it is a very sensitive component. This table perfectly illustrates the relationship that exists between dry bulb temperature, wet bulb temperature and relative humidity. This link shows another hydrometer, which is superior to this model, with the ability to recalibrate it with two humidity standards. If there are any questions about this hydrometer PCE-555, please have a look at the technical specification below or call: UK customers +44(0) 23 809 870 30 / US customers +1-410-387-7703. Our engineers and technicians will gladly advise you regarding the hydrometers or any other products in terms of regulation and control, or scales and balances of PCE Instruments. 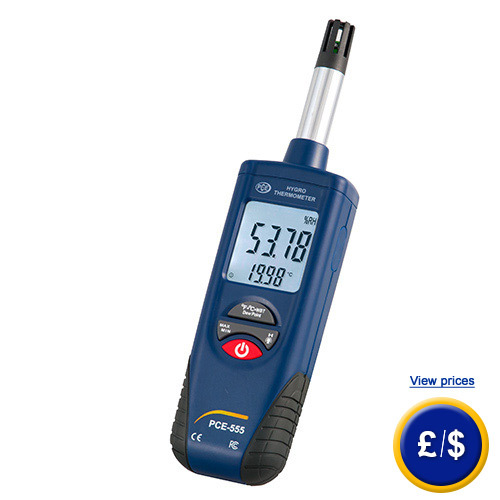 With the PCE-555 hydrometer you can measure ambient conditions including humidity in the top portion of the LCD and temperature shown on the bottom. 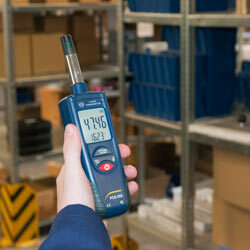 It also calculates wet bulb temperature and dew point, which are useful for calculating thermal stress. There is a small video to the right which shows the device measuring humidity and temperature. 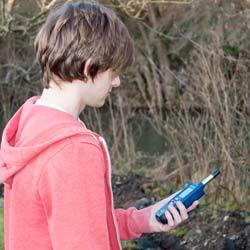 This link shows another hydrometer which can measure relative humidity, temperature, calculate dew point and has memory for storing readings. We also have another type of hydrometer which can measure relative humidity, temperature, calculate dew point and also measure absolute humidity with a sensor. Dew point is the temperature at which air vapour turns into condensation, producing dew or mist, or if the temperature is low enough, frost. This link has more information about temperature and the most common units of measurement in the international system of measurement relating to temperature.